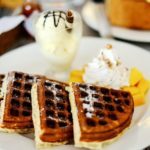 This egg-less Belgian waffle recipe is a twist on all the classic ripe and tangy mango with sweet raspberry desserts we love, made into a topping for healthy egg-less whole-wheat Belgian waffles. The minty raspberry sauce is best homemade. You can add a dusting of sugar over the fruit if you like. 1 Mango One large or two small chopped mangoes. 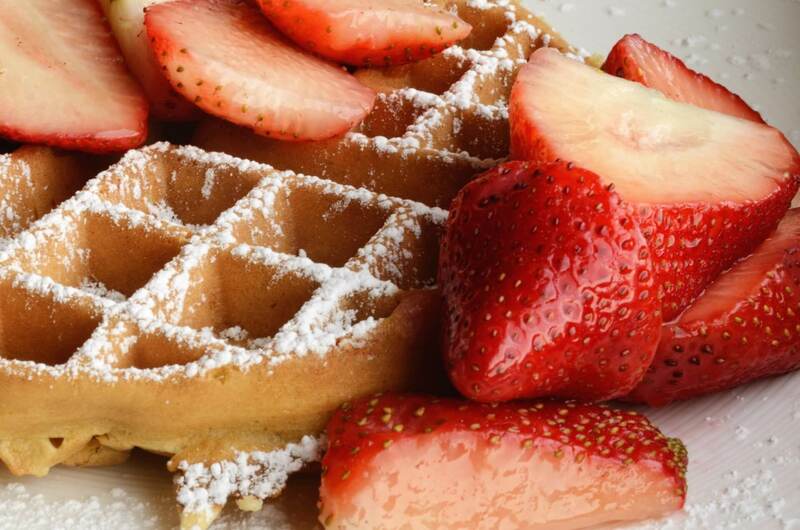 1 packet Stevia If you want sugar-free waffles, otherwise simply use regular sugar. 2 cups Almond milk You can use vanilla flavored as well. Low-fat. For the waffles, pour the wet ingredients in a bowl and mix. Take a second bowl, and mix all the dry ingredients and gently whisk into the wet mixture until it is just combined. Be careful not to over mix the batter, as it can make tough waffles that you'd have to dump in the bin. After combining the batter, gently fold in half the mango you've chopped up. 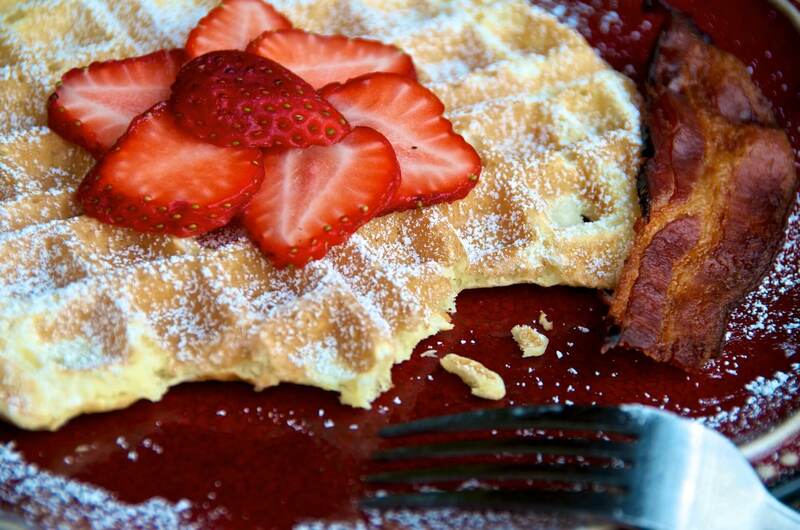 Make your raspberry sauce before you pour the batter into the waffle iron. For the sauce, add the raspberries, honey, butter, mint leaves and water in a small saucepan. Add a little water if you need, to get the right consistency. When the raspberries are just slightly runny and sauce-like, bring them off the heat. The sauce will thicken as it cools; don't strain or blend but keep the pulpiness of the fruit for texture. 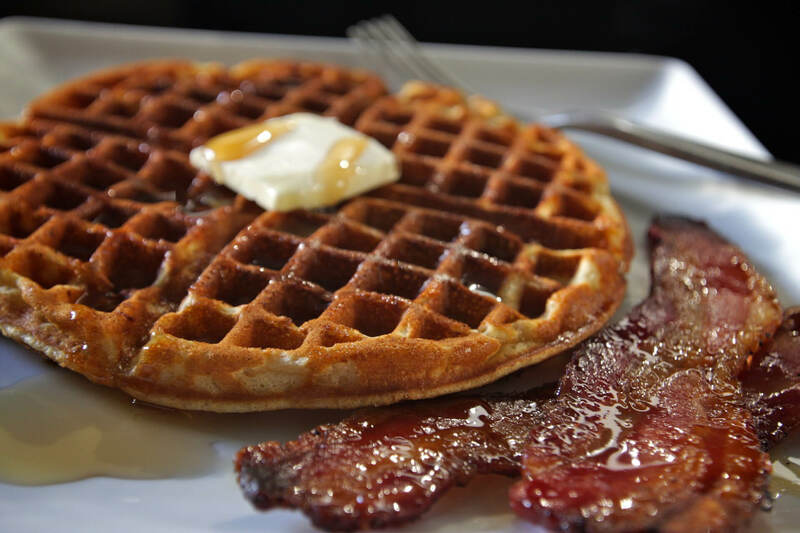 Pour the batter into the waffle iron until it just covers the grid. Cook the waffles until golden brown, it should take about 2 minutes to 3 minutes minutes. When done, top each of the waffles (you should have made 4) with the raspberry sauce and the rest of the chopped mango. Serve immediately, either one or half waffle per person.